October 26, 2013 2:00 p.m. 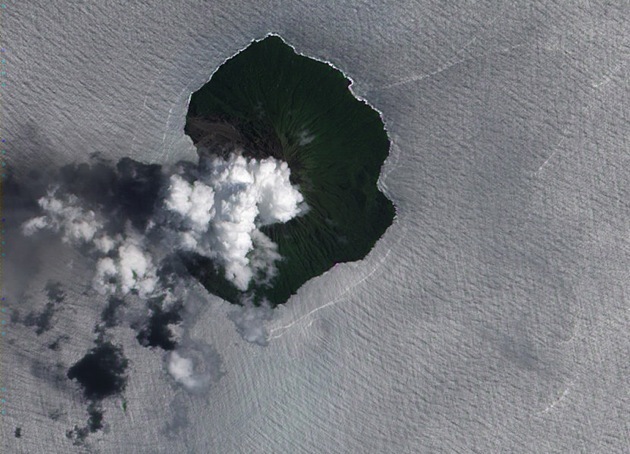 Steam and ash plume over Tinakula Island. Courtesy of Jesse Allen and Robert Simmon, NASA Earth Observatory. Triple Canopy is pleased to present Speculations (The Climate), the first of two roundtables on climate change and the future, as part of Marfa Dialogues/New York. Following on our summer project at MoMA PS1, Speculations ("The future is ________"), and as part of our upcoming Speculations issue, Triple Canopy is inviting scientists, scholars, and artists to discuss pressing issues around climate-change adaptation and mitigation, surveying a range of viewpoints on ecology and nature. The second roundtable, Speculations (On Nature), will take place on Saturday, November 23. Speculations (The Climate) will consider the science, ethics, and politics of solar geoengineering, a set of technologies intended to reflect sunlight and reduce global warming, perhaps by injecting particles of sulfuric acid into the upper atmosphere. How much do we know about geoengineering’s climactic and social effects, and how does geoengineering fit into larger debates around climate change, the carbon economy, and global inequality? Participants include Holly Jean Buck, George Collins, and Christian Parenti. Special thanks to Ballroom Marfa, the Robert Rauschenberg Foundation, and the Public Concern Foundation for their support of this project.